The Jagdpanzer 38(t) was intended to be more cost-effective than the much more ambitious Jagdpanther and Jagdtiger designs of the same period. Using a proven chassis, it avoided the mechanical problems of the larger armoured vehicles. It was better armoured than the thinly armoured earlier Panzerjäger Marder and Nashorn with a sloped armour front plate of 60 mm sloped back at 60 degrees from the vertical (equivalent in protection to about 120 mm), carried a reasonably powerful 75mm gun, was mechanically reliable, small and easily concealed. It was also cheap to build. The Jagdpanzer 38(t) succeeded the open-top Marder III (based on the same chassis) in production from April 1944; about 2,584 were built until the end of the war. 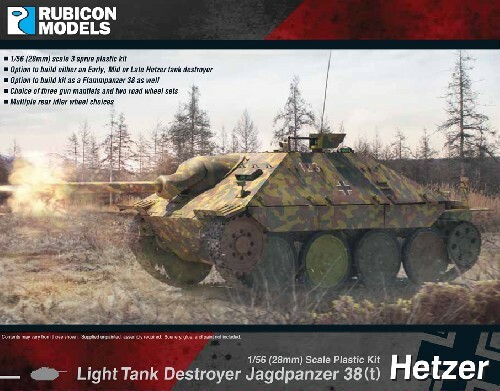 The Jagdpanzer 38(t) fit into the lighter category of German tank destroyers that began with the Panzerjäger I, continued with the Marder series and ended with the Jagdpanzer 38(t). The 75 mm PaK 39 L/48 gun of the Jagdpanzer 38(t) was a modified version of the 75 mm StuK 40 L/48 used in the StuG III and StuG IV assault guns. With this gun the Jagdpanzer 38(t) was able to destroy nearly all Allied or Soviet tank types in service at long ranges (except heavy tanks) and its fully enclosed armour protection made it a safer vehicle to crew than the open-topped Marder II or Marder III series. The Jagdpanzer 38(t) was one of the most common late-war German tank destroyers. It was available in relatively large numbers and was generally mechanically reliable. Like some other late-war German SPGs, the Jagdpanzer 38(t) mounted a remote-control machine gun mount which could be fired from within the vehicle. The Flammpanzer 38(t) was a Jagdpanzer 38(t) modified with a Keobe flamethrower in place of the main gun. It was deployed on the Western Front, with first use during the Battle of the Bulge. Less than 50 units were produced.